We see our share of pitches for perpetual motion machines in the Hackaday tips line, and we generally ignore them and move along. And while this magnetic levitation motor does not break the laws of thermodynamics, it can be considered a perpetual motion machine, at least for certain values of perpetuity. The motor that [lasersaber] presents in the video below is unconventional, to say the least. It’s not a motor that can do any useful work, spinning at a stately pace beneath its bell-jar enclosure as it does. The design is an extension of [lasersaber]’s “EZ-Spin” motor, which we’ve featured before, and has the same basic layout – a ring of coils wired in series forms the stator, while a disc bearing permanent magnets forms the rotor. The coils, scavenged from those dancing flowerpot solar ornaments, are briefly energized by the rotor passing over a reed switch, giving the rotor a little boost. The difference here is that rather than low-friction sapphire bearings, this motor uses zero-friction magnetic levitation using pyrolyzed graphite discs. The diamagnetic material hovers above a rare-earth ring magnet, supporting a slender vertical shaft that holds the rotor and another magnetic bearing at the top. It’s fussy to adjust, but once it’s stable, the only friction in the system should be the drag caused by air in the bell jar. [lasersaber]’s current measurements of the motor running at slow speed are hard to believe – 150 nanoamps – leading to an equally jaw-dropping calculated run-time on a single AA battery of 89 millennia. [lasersaber] is the first to admit that he’s not confident with his measurements, but it seems clear that his motor will likely outlive any chemical battery used to power it. Whatever the numbers are, we like the styling of the thing, and the magnetic bearings are cool too. Continuity testing is one of the most valuable functions on the modern multimeter. It will help you investigate wiring problems in your car, tell you if you’re holding a nullmodem serial cable or the regular kind, and even reveal when you’ve accidentally shorted the data lines right to the power supply. However, all that beeping can get annoying, so [bitelxux] built a vibrating version instead. The build was borne out of necessity; [bitelxux]’s meter lacked a buzzer, and it grew frustrating to always look at the display. In order to allow late night hacking sessions to go on undisturbed, an unobtrusive vibrating tester was desired, as opposed to the usual audible type. Two whiteboard markers donated their shells to the hack, fitted with small nails to act as probes. Inside, a pager vibration motor is connected, vibrating when continuity is found. The circuit runs from a 1.5V AA battery which neatly fits inside the marker shell. It’s a basic build, but gets the job done with a minimum of fuss using parts that most makers probably have lying around. Of course, you can always go a slightly more complicated route and throw an Attiny at the problem. Low-slung body style. Four-wheel drive. All electric drivetrain. Turns on a dime. Neck-snapping acceleration. Leather seating surface. Is it the latest offering from Tesla? Nope; it’s a drill-powered electric utility vehicle, and it looks like a blast to drive. Surprisingly, this isn’t a just-for-kicks kind of build. There’s actually a practical reason for the low form factor and long range of [Axel Borg]’s little vehicle. We’ll leave the back story to the second video below, but suffice it to say that this will be a smaller version of the crawler NASA used to roll rockets out to the launch pad, used instead to transport his insanely dangerous looking manned-multicopter. The running gear on this vehicle is the interesting bit: four hefty electric drills, one for each of the mobility cart wheels. The drills are powered by a large series-connected battery pack putting out 260V at full charge. The universal motors of the drills are fine with DC, and the speed of each is controlled via the PWM signals from a pair of cordless drills. The first video below shows [Axel] putting it through its paces; he didn’t hold back at all, but the vehicle kept coming back for more. We know this cart is in service to another project, but we’d have a hard time concentrating on anything if we had the potential for that much fun sitting in the shop. Still, we hope that multirotor gets a good test flight soon, and that all goes well with it. When designing model aircraft of any shape or size, it’s useful to know the performance you can expect from the components chosen. For motors and propellers, this can be difficult. It’s always best to test them in combination. However, with the numbers of propeller and motor combinations possible, such data can be tough to come by. [Nikus] decided it would be easier to just do the testing in-house, and built a rig to do so. The key component in this build is the strain gauge, which comes already laced up with an Arduino-compatible analog-digital converter module. Sourced for under $10 from Banggood, we can’t help but think that we’ve got it easy in 2018. 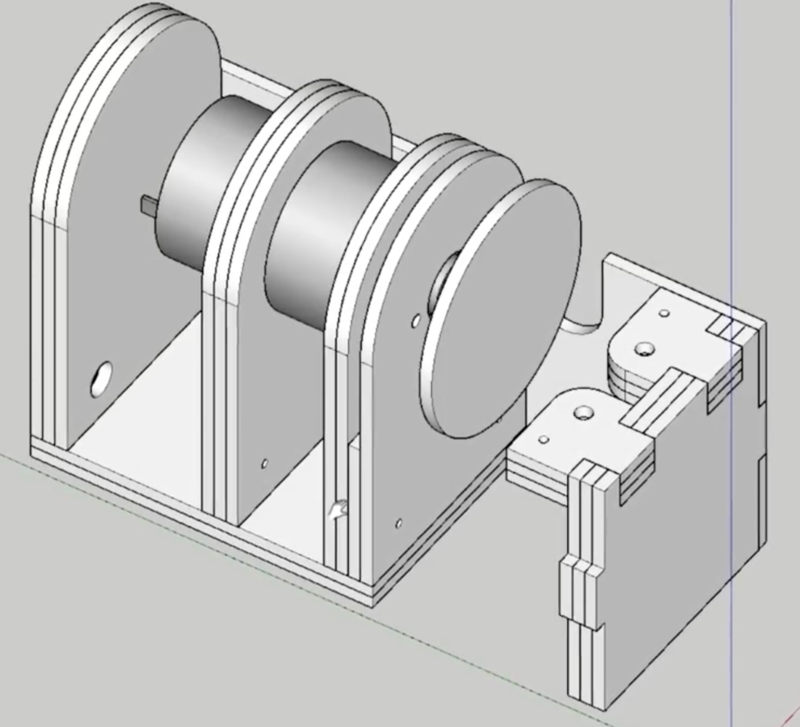 A sturdy frame secures motor and propeller combination to the strain gauge assembly. An ATMEGA328 handles sending commands to the motor controller, reading the strain gauge results, and spitting out data to the LCD. It’s a cheap and effective build that solves a tricky problem and would be a useful addition to the workshop for any serious modeler. We’ve seen other approaches in this area too, for those eager to graph their motor performance data. Video after the break. Casually browsing YouTube for “shop improvements” yields a veritable river of project ideas, objects for cat amusement, and 12 INCREDIBLE SHOP HACKS YOU WON’T BELIEVE, though some of these are of predictably dubious value. So you might imagine that when we found [Henrique]’s adorable disc sander we dismissed it out of hand, how useful could such a tiny tool be? But then we remembered the jumbo tub o’ motors on the shelf and reconsidered, maybe a palm sized sander has a place in the tiny shop. Electrically the build is a simple as can be. It’s just a brushed DC motor plugged into a wall wart with a barrel jack and a toggle switch. But what else does it need? This isn’t a precision machine tool, so applying the “make it out of whatever scrap” mindset seems like a much better fit than figuring out PWM control with a MOSFET and a microcontroller. There are a couple of neat tricks in the build here. The most obvious is the classic laser-cut living hinge that we love so much. [Henrique] mentions that he buys MDF in 3 mm sheets for easy storage, so each section of the frame is built from layers that he laminates with glue himself. This trades precision and adds steps, but also give him a little flexibility. It’s certainly easier to add layers of thin stock together than it would be to carve out thicker pieces. Using the laser to precisely cut holes which are then match drilled through into the rest of the frame is a nice build acceleration too. The only improvement we can imagine would be using a shaft with a small finger chuck (like a Dremel) so it could use standard rotary tool bits to avoid making sanding disks by hand. If you want to make one of these tools for your own desk, the files are here on Thingiverse. And check out the video overview after the break.